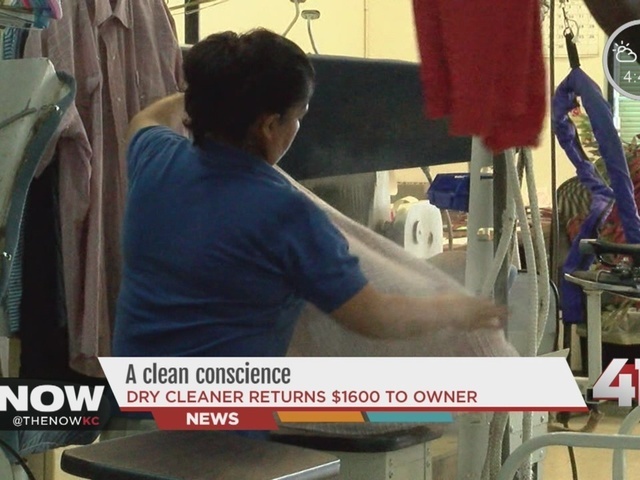 Kristin Foltz has found all kinds of stray items left in pockets during her time at Fifth Avenue Cleaners. "Handkerchiefs to cash to gum to ink pens, everything," she said. But recently she made her most lucrative discovery. "He came in, dropped off [his] pants, [I] went through the pockets to tag it, to get inventory and there was a substantial amount of money in it," said Foltz. That substantial amount of money was $1600, and it belonged to John Paris. You see, he'd just returned from a trip to Greece. And between jet lag and his laundry list of errands he failed to check his pockets. "[It] was there and when I came home I thought about the money," said Paris, a native of Greece. "I said what happened to the money? What did I do with the money? I knew it was in my pants." In the meantime, Fifth Avenue Cleaners took it, and put it in the company safe until Paris could pick it up. "They are so nice," he said with a smile on his face. "I don't know other people who would do that. I didn't have any proof. They could've said 'you put the pants here, you should look in the pants before you dropped them here.' So I'm really happy, I'm really happy." Foltz said she wouldn't think twice about doing the right thing all over again. "I don't want that kind of karma," said Foltz. "I'm not that kind of person, and neither is anyone who works here. He obviously needed it for a reason." And as for Paris, he says he got more out of the experience than his returned money. Foltz reminded him that there are still honest people in the world. And, he said there's no dollar amount you can put on that.